No fees for cross, counter, or third-party complaints. No other initial "court costs" as in state court. $11.00 for certified copy (plus $.50 for each copy involved). $47.00 to register an out-of-district judgment. $19.00 for Certificate of Good Standing - to request a certificate of good standing, please email the Clerk's Office at certificate@tnmd.uscourts.gov. $38.00 for Appeal of Misdemeanor conviction entered by Magistrate Judge (if defendant not pauper). $100.00 per Attorney for pro hac vice. For retrieval of one box of records from a Federal Records Center, National Archives, or other storage location removed from the place of business of the court, $64. For retrievals involving multiple boxes, $39 for each additional box. $53.00 for any check returned for lack of funds. $5.00 for filing fees for habeas corpus. $22.00 for exemplification of any document. Except as provided herein, personal or business checks are accepted only from attorneys and employees of attorneys, law firms, law students and the press. 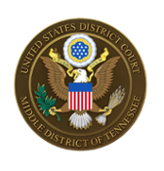 (All checks & money orders should be made payable to the Clerk, U.S. District Court). Personal checks are not accepted for criminal bonds, which require cash, a money order or a cashiers check. Personal checks are accepted for criminal fines and special assessments.